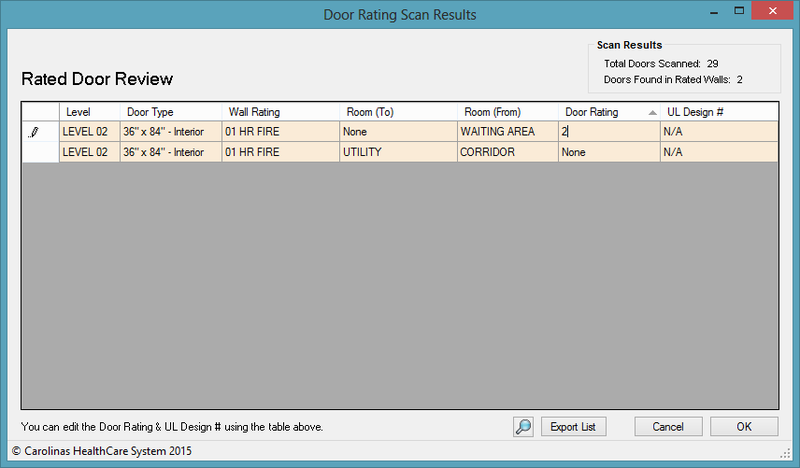 Rated Door: Scans the entire project for rated walls and displays a list of every door that is hosted inside of a rated wall. The app will provide a report showing the door information (level, door type, room, and fire rating). The report can be exported to .csv format for review. Damper: Scans the entire project for clashes between rated walls, ductwork and dampers. This check must be run from the file that contains the ductwork and dampers. If very few walls exist in the current project you will be prompted to select a linked file that contains walls. The app will provide a report of all dampers in the model as well as clashes between ductwork and rated walls. The report can be exported to .csv format for review. The Code Compliance add-in is brought to you by SouthEastern Technical Services, LLC and is priced at USD 30.00.